If you had U.S. health coverage in 2015, a tax Form 1095 will hit your mailbox beginning in late January. Why are you getting the form, and do you need it to file your taxes? You’ll get Form 1095-A, B or C from your insurer, your employer or the government, depending on the kind of plan you had. Some people may even get two forms, one from their employer and one from their insurer. And if you switched coverage during the year, you will get one or more forms for each of your plans. So what is it? Form 1095 tells the government that you had qualifying health coverage, also called minimum essential coverage. This is important, because people who don’t have qualifying coverage for each month or don’t qualify for an exemption could have to make a shared responsibility payment under the Affordable Care Act. Insurers and large employers have to report this information to the government for each person covered under their plans. They have to send their plan members — that’s you — a copy of the form as well. 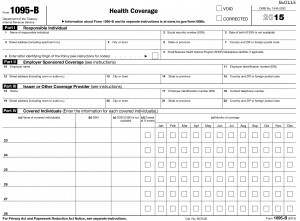 The IRS uses information from these forms to confirm who had health coverage. Watch for your forms to arrive in January or early February. For the full article from Aetna, please click here. Next PostNext Confused by Health Care Reform?